The book is about Angie, a 6 yr. old girl, and her perspective on families. She talks about divorce,single parent families,and different family make up such as, lion families,her spanish friend's big family,an adopted cousin, even pets get a mention.The photos were in black and white and depicted the topic. I woulg read to younger students.The illustrations are nicely done and work nicely with the text. Easy for young readers to read individually.If they had trouble with some words, they would be able to sound them out. Wonderful nonjudgmental depiction of caring loving families. I would recommend this book for 1-5 grade students. It would also be good for teaching family diversity. I like the fact that there were some less often depicted families mentioned. While the content of this book is certainly appropriate for an early primary-grade unit on families, the illustrations are too detailed--insufficiently bold--for young children and there are far too many "characters" to keep track of. Having said that, I can recommend the book for its treatment of the many varieties of families--traditional and non-traditional. This book would not be my first choice, however. Families are Different by Nina Pellegrini, though more limited in scope, has the colour and simplicity that are required in a picture book for younger readers. I even prefer Gretchen Super's What is a Family? though I think that it, too, is overly long. I like this book because there introduces there are very few types of families not mentioned. The illustrations are black and white pen drawings with lots of details. 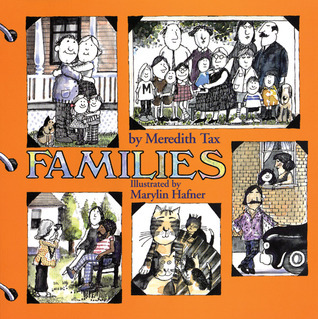 If there is a child with a non-traditional family dynamic, this book can help the child know that his or her family is okay because their family is mentioned in this book right along with lots of other types of families. I like this book because the little girl in the story was explaining the different types of families that her classmates have including divorce, single parents, gay/lesbian families, and single parent families. It explains that families come in all different shapes and sizes. This book had good illustrations. This book would help students to understand about different families ( gay, single parents, step parents,etc).It gives students insight into the multicultural world we live. It helps students to learn or practice Spanish language. Beautiful book -- in text and illustration. Published in 1981. Probably would be best used in small group or one-on-one read aloud to make space for rich conversation and really looking at the detailed illustrations. About all kinds of different families including adoptive families. Cute book, made me laugh too. This book is written entirely in Spanish. It teaches children about the different kinds of families - single families, divorced parents, step parents.